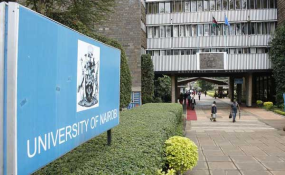 Nairobi — The University of Nairobi, Kenyatta University, and Moi University are the top public universities which are beneficiaries of research funding at Sh538 million, Sh457 million, and Sh302 million respectively, a study published by CPS International on Tuesday indicates. According to the study conducted between May and June this year, Strathmore, Mount Kenya, and Aga Khan universities are top beneficiaries of research funding among private universities, the three listed as seventh, ninth, and tenth overall in the combined category of public and private universities. The study captioned "The State of Research Funding in Kenyan Universities" indicated that the research endeavours for the three universities were funded to the tune of Sh100 million, Sh87 million, and Sh75 million respectively. CPS International however called for more funding with the current allocations for research falling far below 2 per cent of GDP, a threshold recommended by the United Nations Educational, Scientific and Cultural Organization (UNESCO). CPS International Research Director, Prof Herman Manyora, also urged the private sector to fund research in universities to bridge the existing gap. "Research is such an expensive undertaking, there's no way government can fund it even if they were to play according to the rules," Prof Manyora said when he released the report. "There's need for other players to come on board and thus we recommend that universities partners with the private sector in addition to enhanced financing of research," he added. The National and County governments were singled out as key financiers of research in Kenyan universities at 68 per cent, with businesses and NGOs contributing 32 per cent. According to the research, top 10 public universities in the 2018 academic year received a total of Sh1.5 billion in research funding compared to top ten private universities that received Sh117 million. Jomo Kenyatta University of Agriculture and Technology (JKUAT), Egerton University, Maseno University, Masinde Muliro University of Science and Technology (MMUST), University of Eldoret, Technical University of Kenya (TUK), and South Eastern Kenya University completed the top ten list of most funded public universities, the seven receiving Sh236.5 million, Sh122.4 million, Sh108 million, Sh90.6 million, Sh70.4 million, Sh50.1 million, and Sh27.2 million for research. The United States International University (USIU), KCA University, Catholic University of Eastern Africa (CUEA), Management University of Africa, St. Paul's University, African Nazarene University, and Daystar University completed the top 10 chart among private universities with Sh56 million, Sh51.7 million, Sh29.5 million, Sh25.5 million, Sh24 million, Sh23.8 million, and Sh22.8 million in research funding respectively. The top 10 national universities received Sh611 million in research funding from businesses, NGOs and other donors. The funding for top ten public universities from businesses, NGOs and other donors was reported at Sh464 million with that for top ten private universities placed at Sh496 million. In the combined category for public and private universities, JKUAT was listed fourth most funded tertiary institution for research with Sh236.5 million. Egerton University, Maseno University, and MMUST were listed fifth, sixth, and eighth, with Sh122.4 million, Sh108 million, and Sh90.6 million respectively. In the non-State funding category, Kenyatta University, the University of Nairobi, and Strathmore University received the most funding at Sh95 million, Sh88 million and Sh78.8 million respectively. Mount Kenya University, Aga Khan University, Moi University, JKUAT, KCA University, Egerton University, and USIU followed with a funding of Sh71 million, Sh65 million, Sh64 million, Sh53.7 million, Sh47 million, Sh43.6 million and Sh42 million from non-State actors respectively. Overall, the University of Nairobi, Egerton University, and Kenyatta University received government capitation of Sh6.3 billion, Sh2.8 billion, and Sh3.1 billion in the 2017/18 financial year against an estimated student population of 26,009, 15,223, and 21,029 respectively.